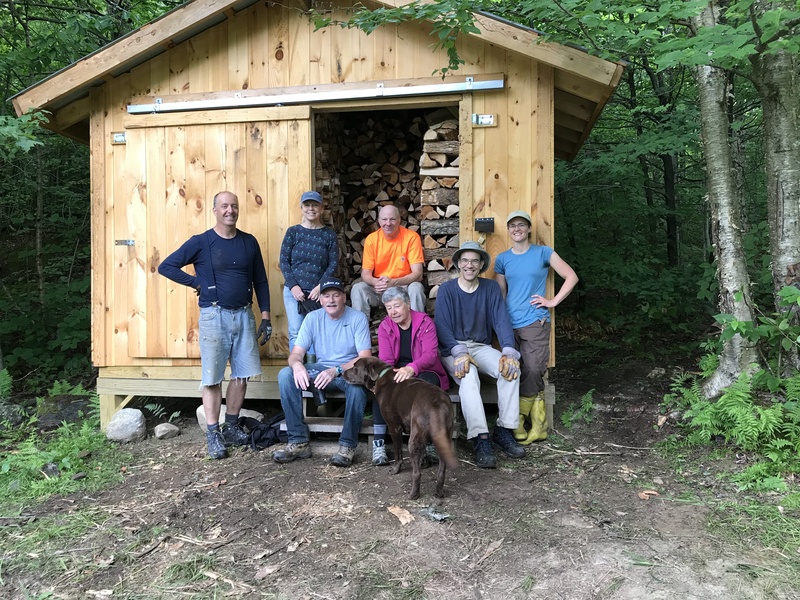 Seven Burlington section volunteers joined GMC Land Stewardship Coordinator Mollie Flanigan at 9 AM on Sunday, June 24 to fill the woodshed at the Bolton Lodge with four cords of wood that had been delivered there. Rain threatened, but never really materialized. 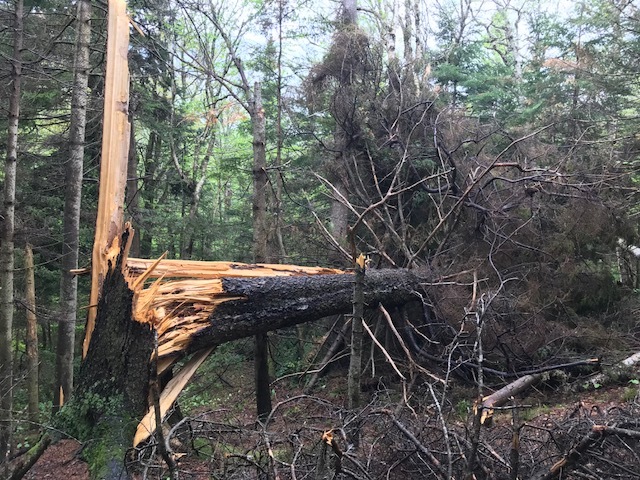 With two people in the woodshed stacking and the rest using log carriers and wheelbarrows to shuttle wood from dump pile and resplit the occasional oversized piece, the job went fast, though not quite as fast as it appears in the video below from Ted. Almost the entire four cords fit in the woodshed, requiring just a small overflow stack behind the woodshed. Volunteers Nancy, Ted, David, Chuck, Annette, Mike, and Hope. 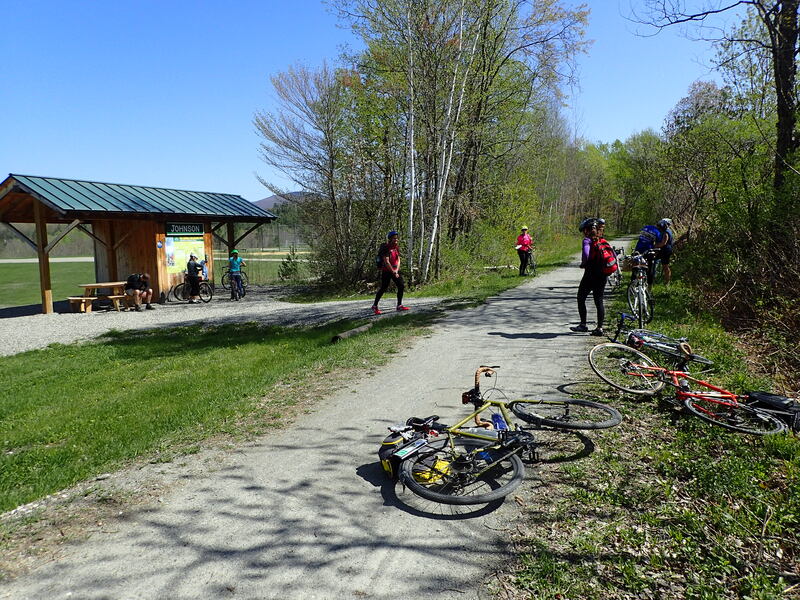 Chittenden county folks met at the Richmond park & ride at 8:30 and carpooled to the Rumney School in Middlesex where we met the Montpelier folks around 9:15, shuttled over to drop two cars at the Worcester trailhead and back to the Middlesex trailhead. 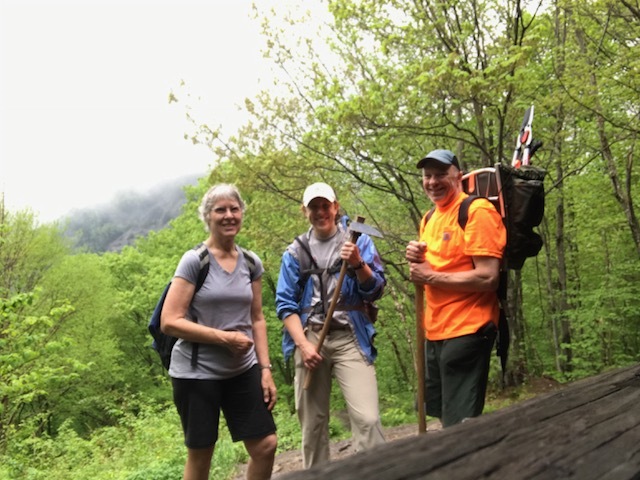 It was drizzling as we started out around 10 AM, but soon stopped, and despite a forecast for rain, we only had a few sprinkles as we started and when we reached Worcester Mountain. 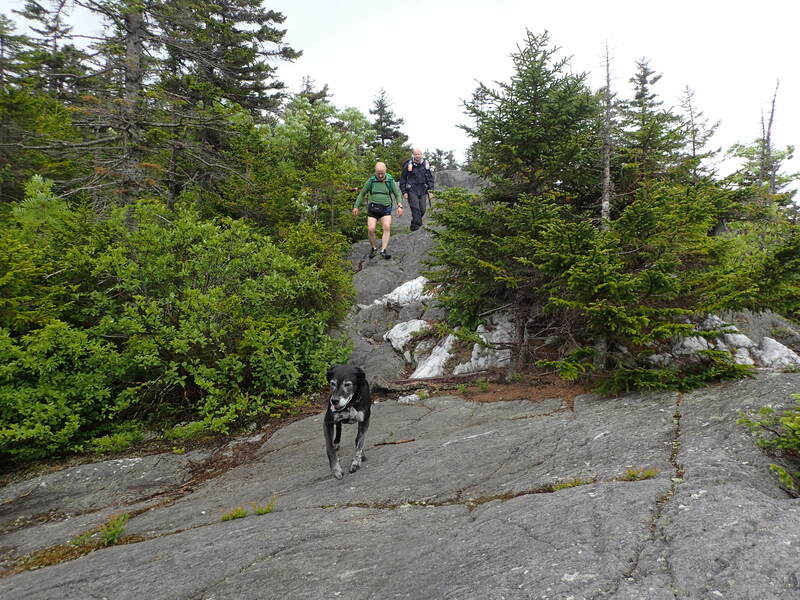 Carl’s 14 year old dog Ceili looked pretty stiff, but proved an able and eager hiker for the entire trip. 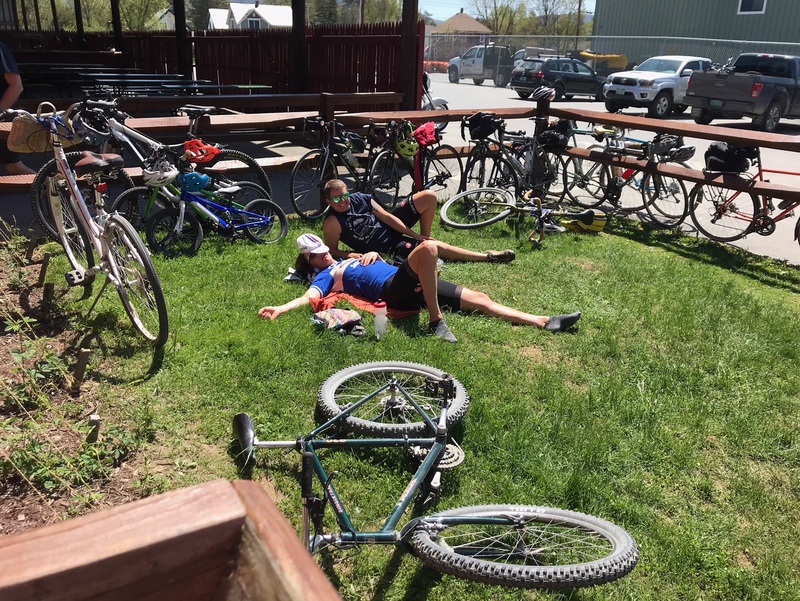 We made great time, reaching the White Rock trail junction around 9:40. 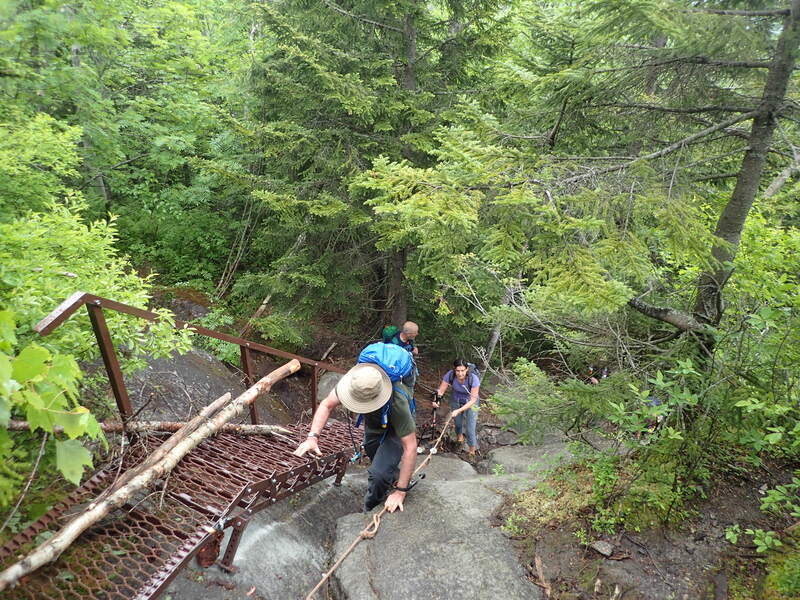 We were surprised to find a brand new metal stairway in place but not yet secured at the point on the Middlesex Trail where the “rope assist” is. It will make that stretch a little less interesting in the future, but since it wasn’t really finished we still used the rope this time. 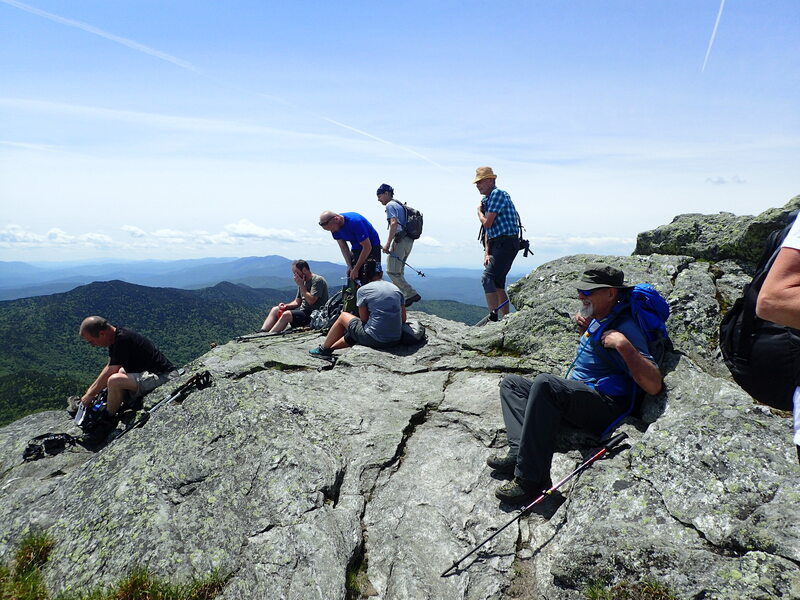 We reached the Mt Hunger summit around 11:45. 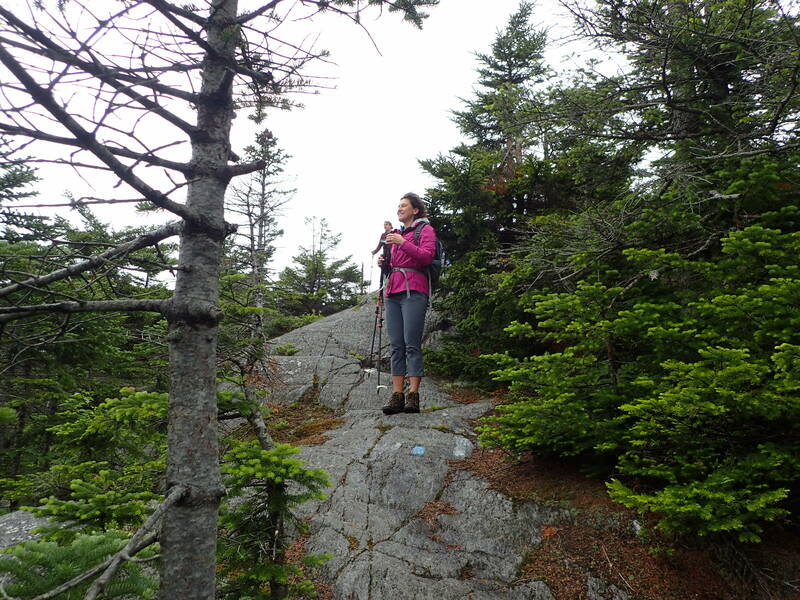 It was overcast, but we still had good views toward Mansfield, Waterbury Reservoir, and the White Mountains. 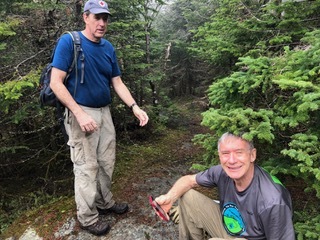 From there we headed north on the Skyline trail, stopping for lunch at 1 PM about 2/3 of the way to the Stowe Pinnacle Trail junction, which we reached around 1:40. 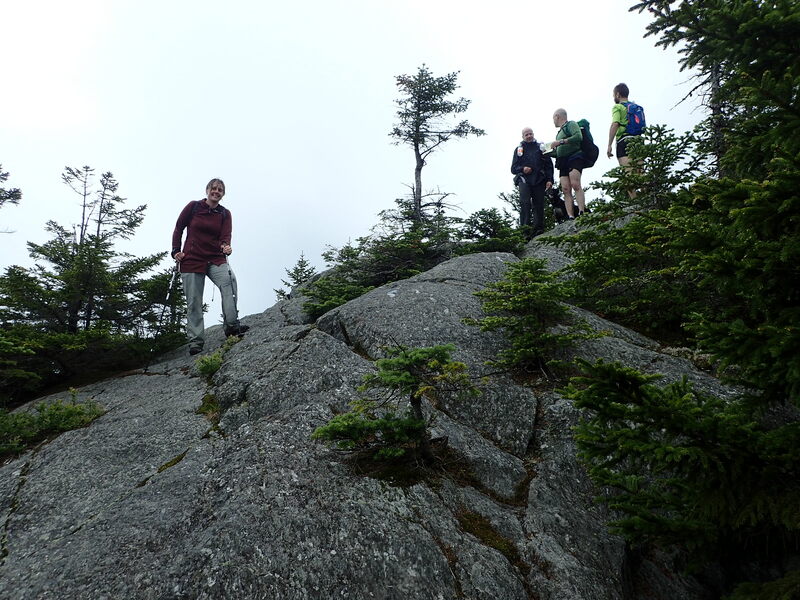 North of the Stowe Pinnacle trail we started encountering many blowdowns requiring short detours. 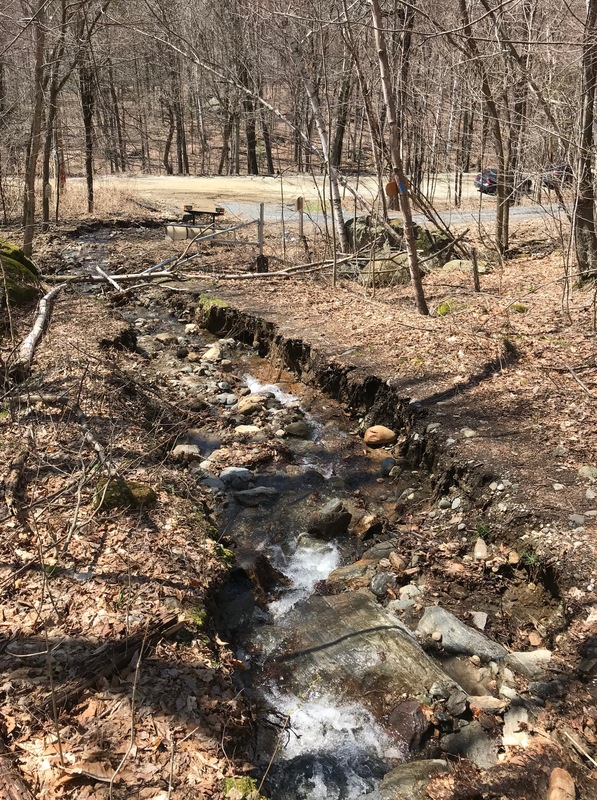 A lot of trail work is needed in this area! 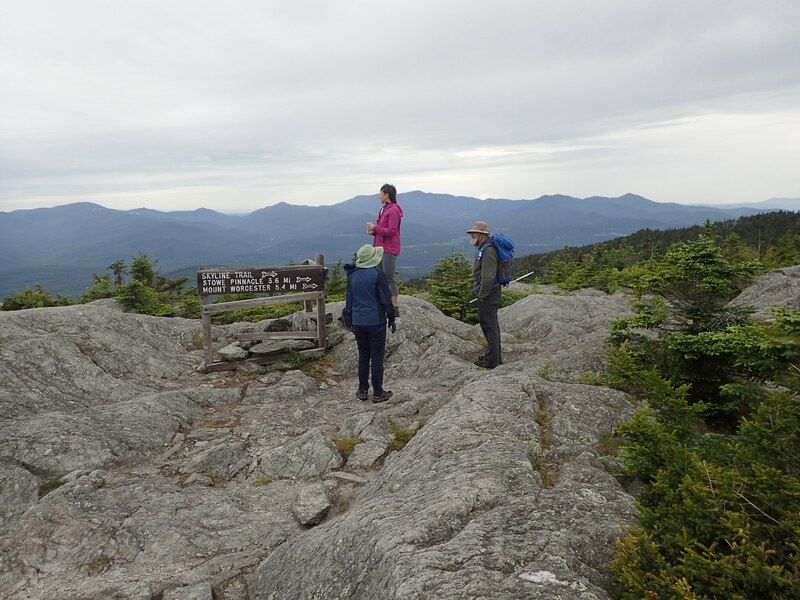 We reached the unnamed peak around 2:30 and the Worcester summit around 3:50, then headed down to reach the cars around 5:30. 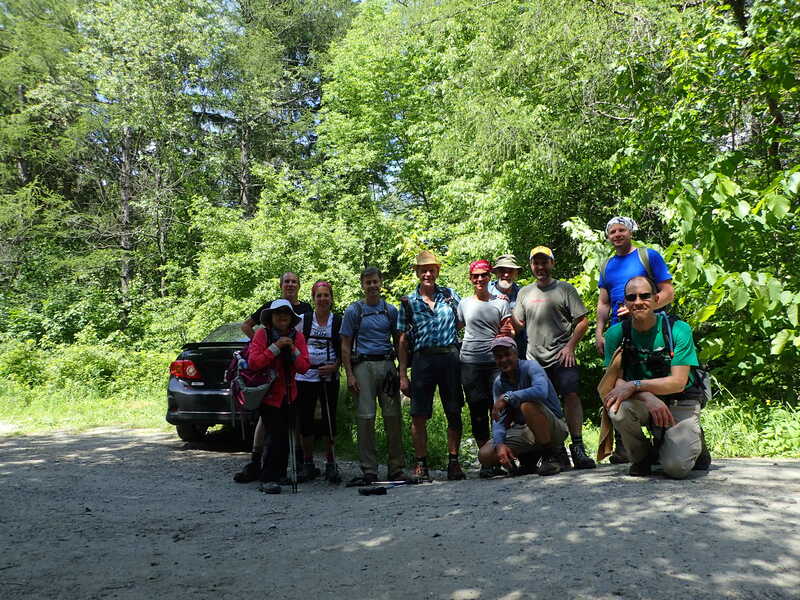 Some of the group then headed for The Reservoir pub in Waterbury for a post-hike get together. Participants: Rob Gordon, Dasha Zentrichova, Becky Grenier, Michael Valente, Carl Etnier, Céilí (dog), David Hathaway (leader). 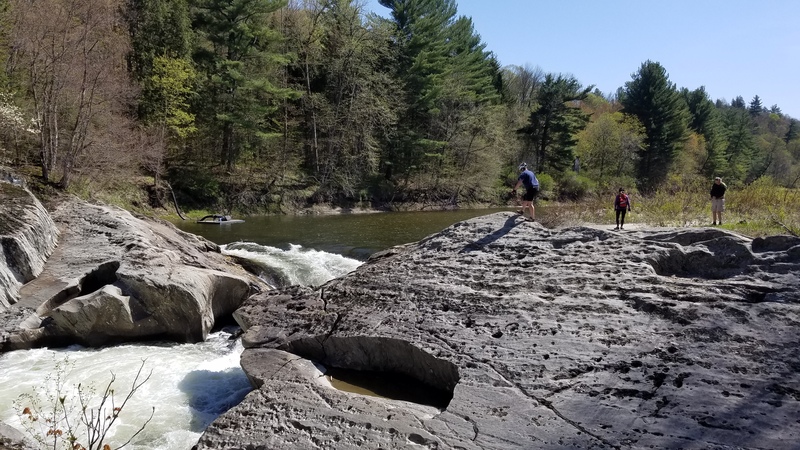 With the double your money back guarantee that outing leaders pledge participants, you can bet I was pleased that the weather was perfect with temps. 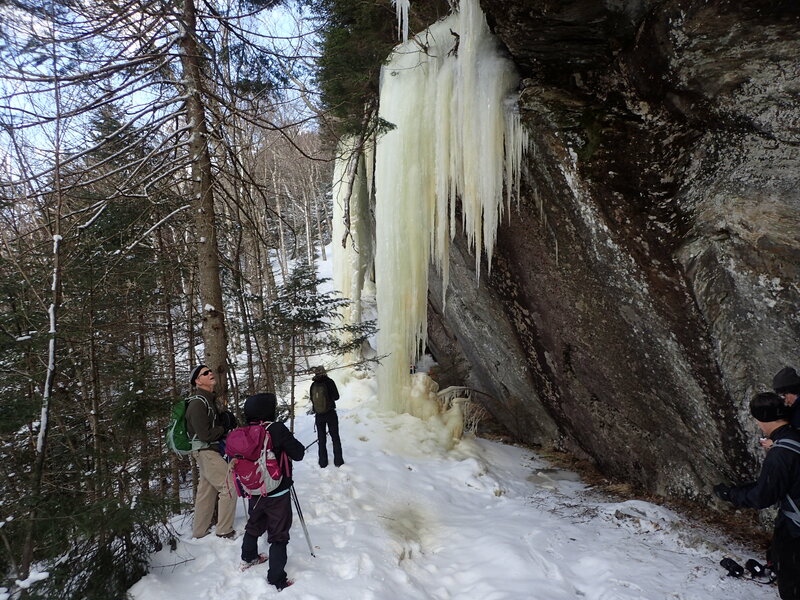 at the trail head parking lot at the top of Camels Hump State Park road in the 60’s! 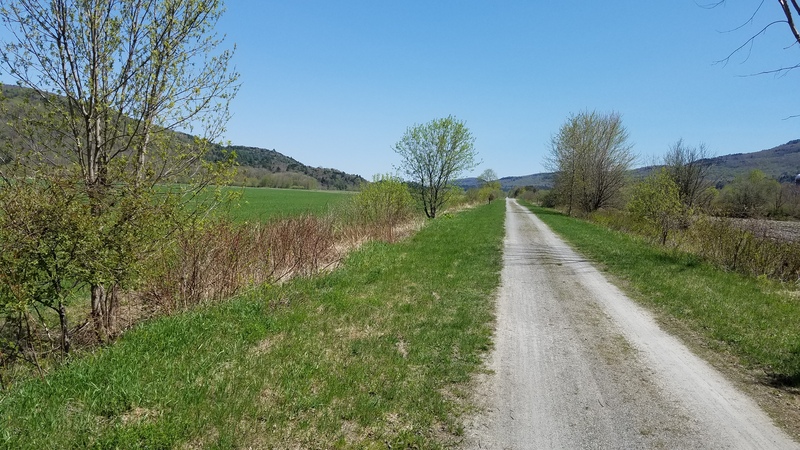 We started at the parking lot and took the Monroe Trail for about 1.3 miles to the Dean Trail, which then climbed an easy grade to the beaver pond (which is on the maps as an actual pond but is more like a mossy wetland now) where there is a nice view of Camel’s Hump summit to the north. 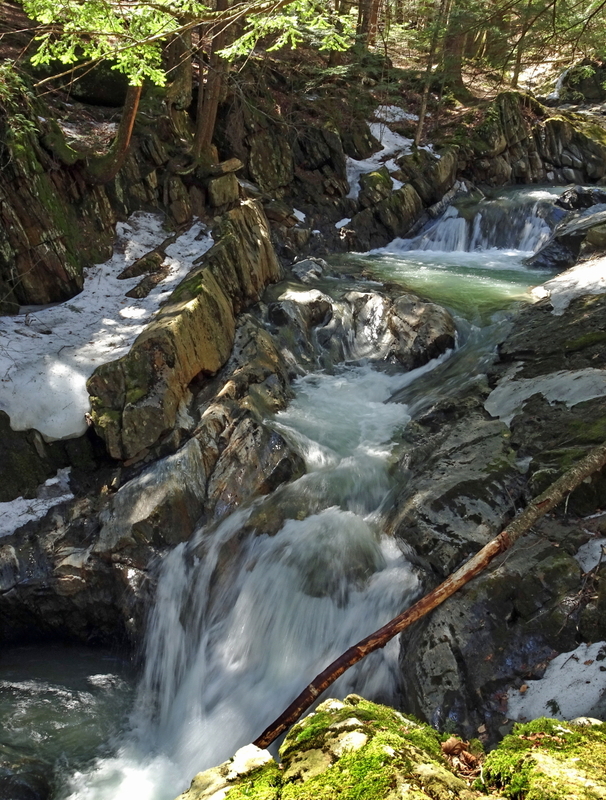 From there I could see hoards of little figures scrambling for a place to stand at the summit. Crowded! 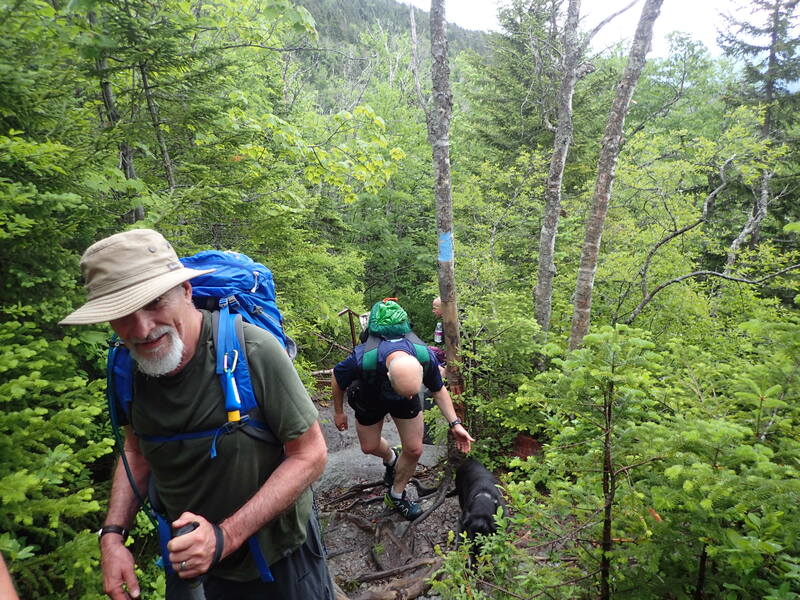 The 3 parking lots and roadside at the trailhead were full of cars – for a Father’s Day outing no doubt. 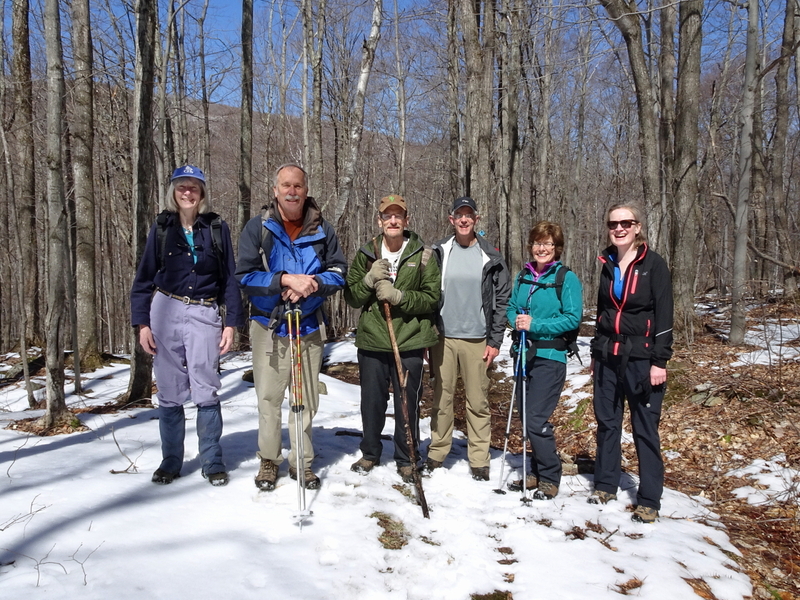 With Gianetta Berti, Nancy Reynolds, Horst Hartlieb, and two friends Ken and Harry who joined at the beaver pond – and provided some of the great photos below. Trip leader Ted Albers. Check out the Lotus in the parking lot (with signs saying ‘dont leave anything valuable in the car’!) How on earth did this car have enough clearance to make it up there? 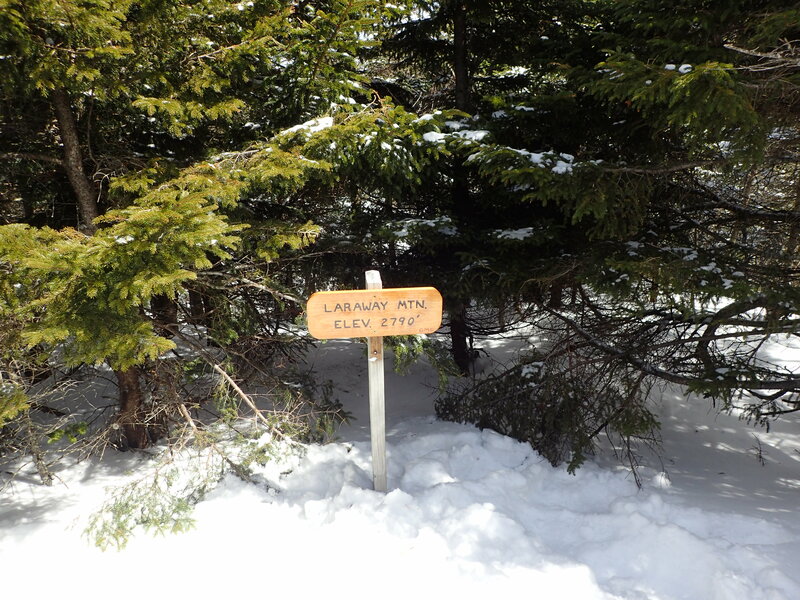 Also note the beautiful new Dean Trail sign by GMC volunteer Howard VanBenthuysen. Darryl Smith, Steve Titcomb, Nick Krembs, Rob Gordon, Reza Ramazani, Chris Slone, Michael Valente, David Hathaway, Kim Farone (leader). 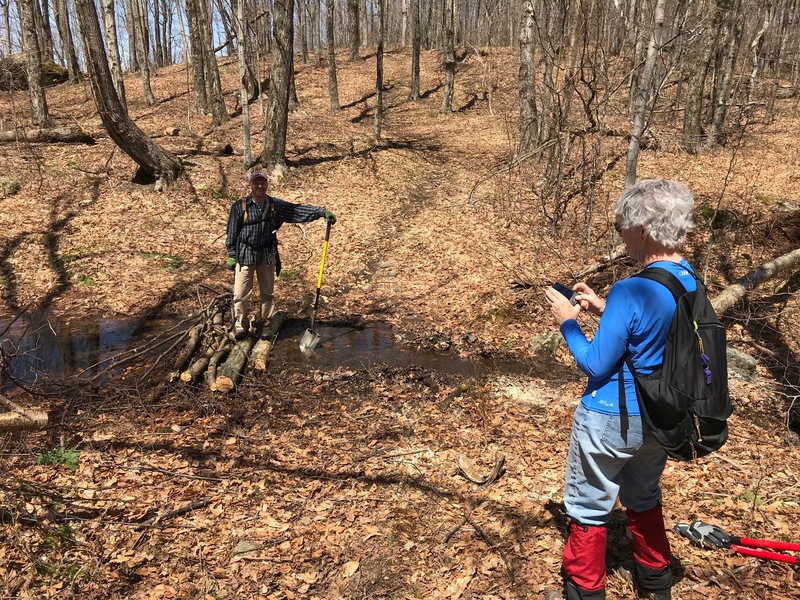 Group 1: We started at the trout club and immediately came on how large hardwood that was across the trail it took us about 40 minutes of Keystone cops like sawing and wedging to get it out of the trail. Turns out the bottom part of it was jammed way in to the ground – anyhow you would’ve been amused. We weren’t. 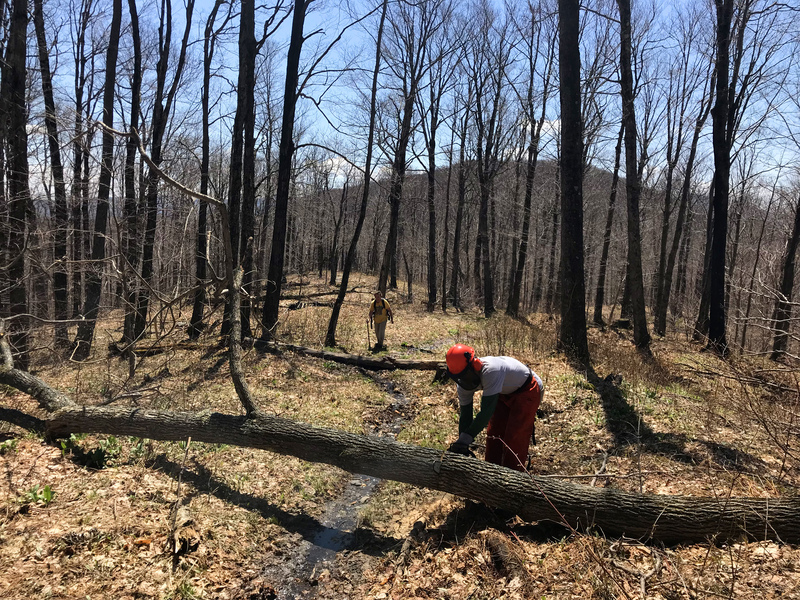 Then a couple of other minor chainsaw cuts and water bar cleaning on the path up to Taylor. 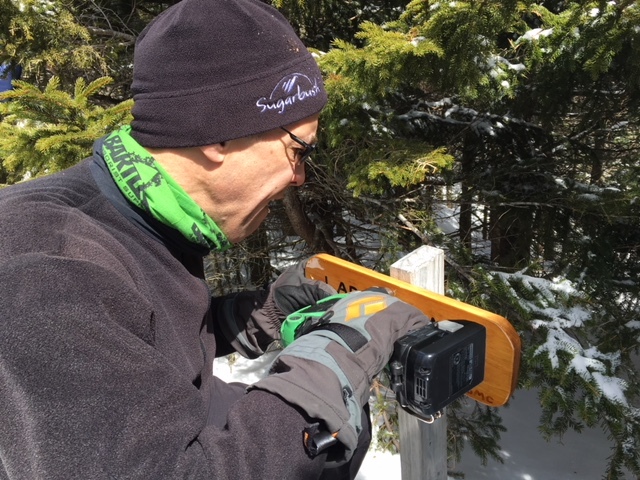 We were able to clip and dig out water bars and use hand saws from Taylor South to the wooden ladder where we stopped and turned around shortly before the big rock garden climb. By then it was 2::30 and our group including me was flagging. 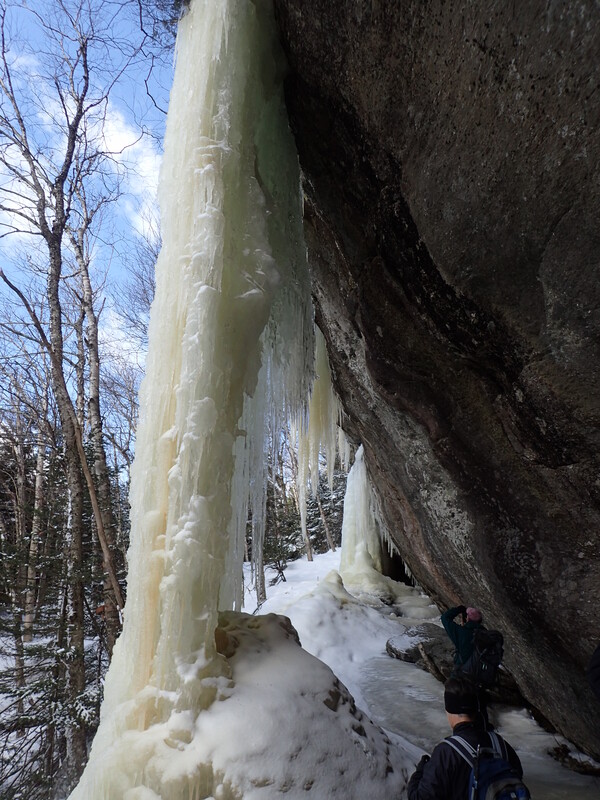 And Reed had turned her ankle very minor on the way up – and she was ready to head back – but was a great sport. Also the three of us are allergic to rain unlike the mighty John and Phil and Scott. 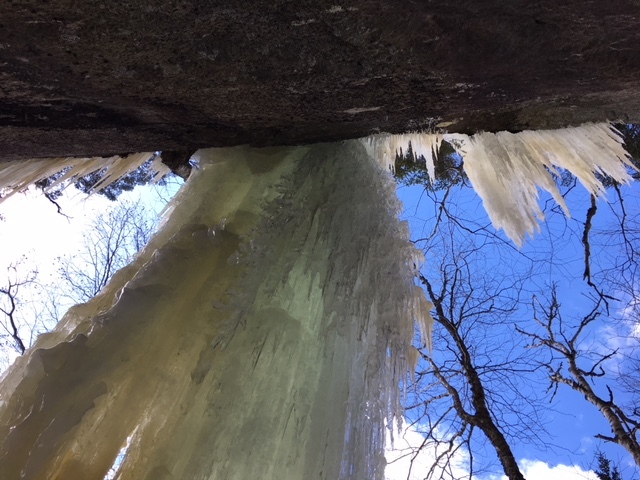 South of the ladder to Mt. Mayo might still need some clipping and water bar work. If so I would approach it from the south – I guess. 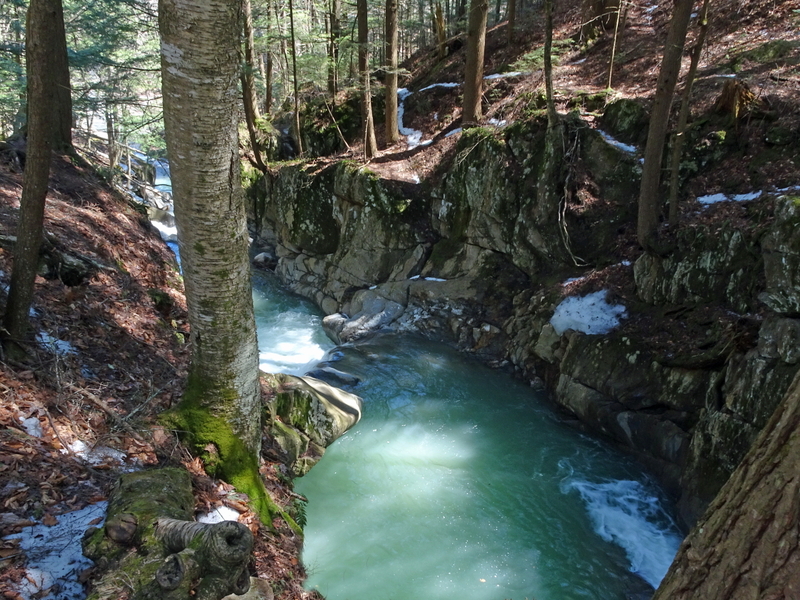 Also north of the latter about halfway to Taylor Lodge there is a section of about 50 yards of the LT which was in a streambed to start with – which is now washed out – at least more washed out than at was. 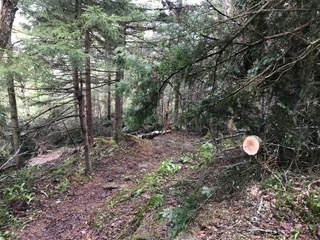 This area will rapidly deteriorate and the club may want to think about looking at it and re-locating this short section of the trail if possible. Participants: Lisa Hardy,Reid Willis, Ted Albers (leader). Group 2: These guys are still smiling after an 11 hr day. Went through 3 tanks of gas and must have cut over 40 blowdowns. Ran out of gas on south side of Bolton Mt. 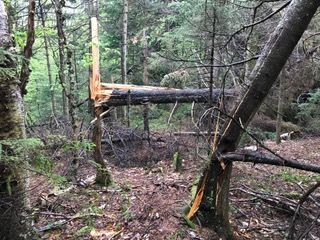 Two blow downs still need to be removed , but can easily get around them. 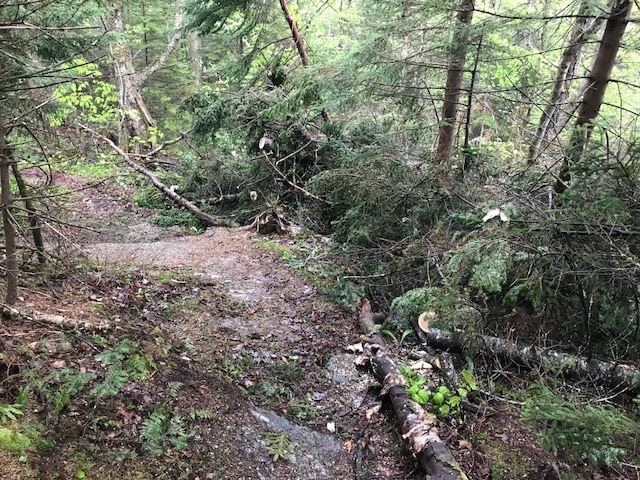 Most blow downs I have encountered in a single outing in my 46 years of doing trail work. Participants: Scott Albertson, Phil Hazen, John Sharp (leader). We met at 9 AM at the Jeffersonville park & ride on Rt 15 on a cool sunny morning. 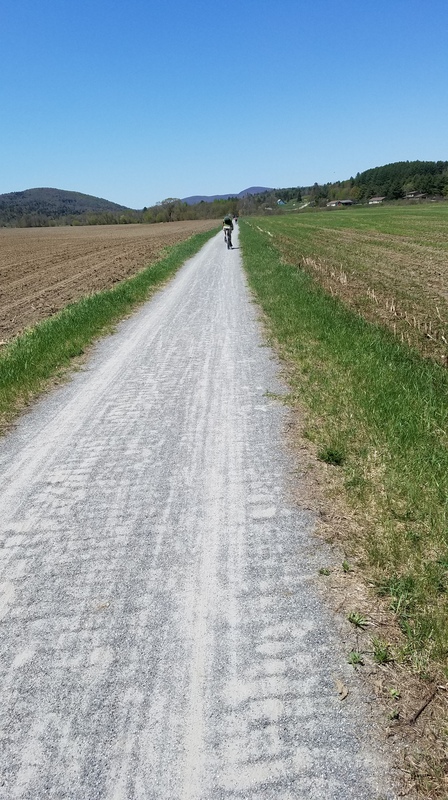 We hopped on the Cambridge Greenway trail which is a short spur at around mile 64 of the LVRT. 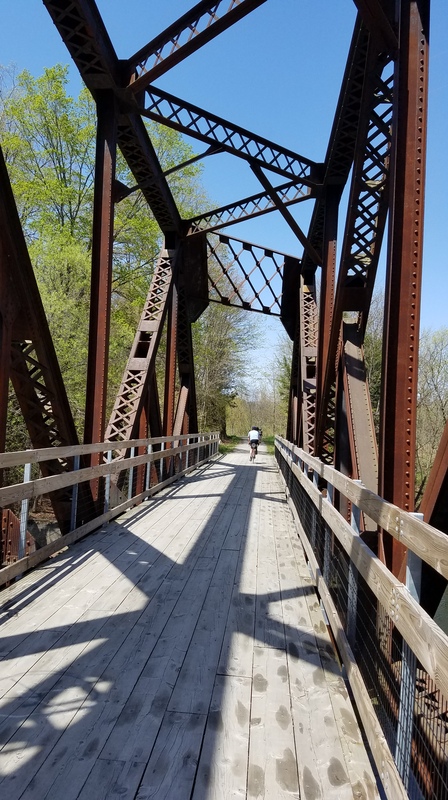 We went across the new Lamoille River bridge by Cambridge Junction to the current end of the trail (though it continues to be extended) at VT 109, then turned around and headed east, following the river. 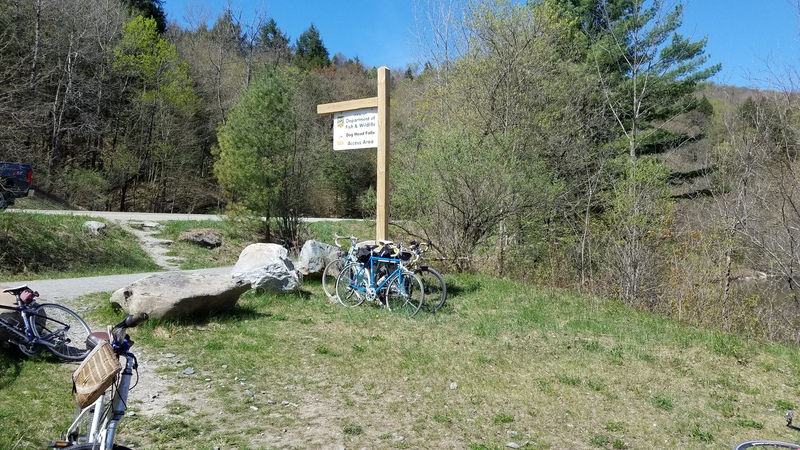 After inflating an underinflated tire that had been slowing one of our group, we crossed Rt 15 and passed the Long Trail crossing and Johnson Farm & Garden, then took a break at the playing fields in Johnson around mile 53. 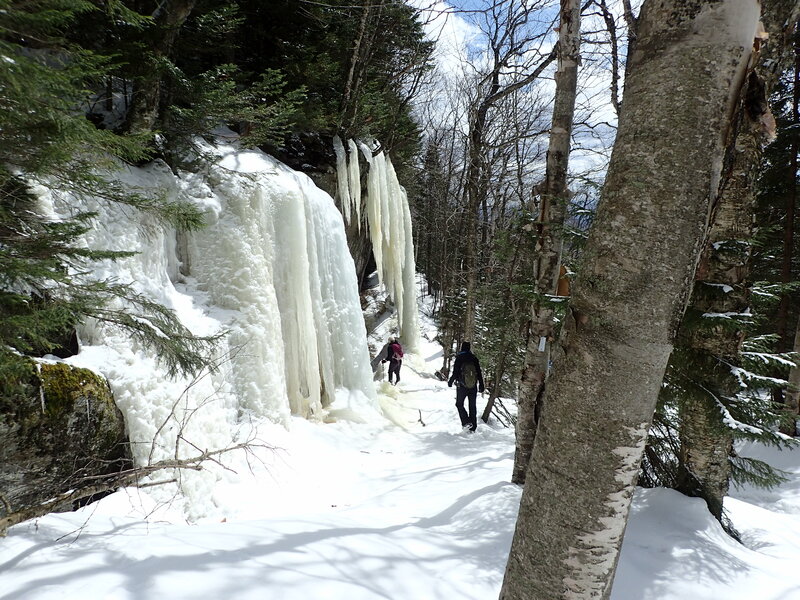 We took another break a little farther along to see Dog Head Falls, then continued east to the other end of this section of open trail at mile 47. 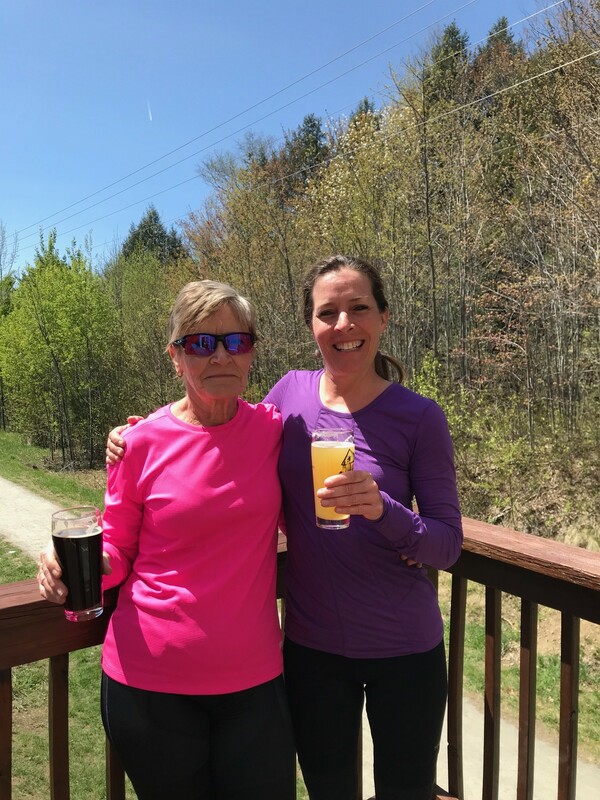 We headed back to Lost Nation Brewing at mile 49, arriving just before noon, where we had lunch and beverages (some we ordered there, some we brought with us). The day had warmed enough that almost everyone who had started in long sleeves was down to short sleeves by this point. 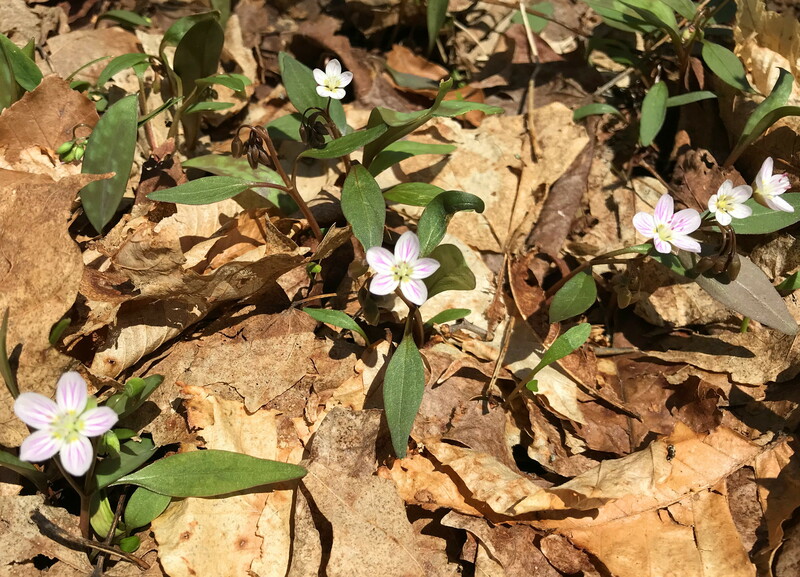 The leaves were just coming out enough to provide a little shade on the trails, and we saw a variety of wildflowers by the sides of the trail, including trout lilies, Marsh marigolds, spring beauty, and purple trillium. After a leisurely lunch we returned the way we’d come, reaching the cars around 2:30. Participants: Robynn Albert, Rowena Albert, Tule Fogg, Sammie van Gerbig, Joy Snow, Nancy, Juri Prince, Kristen McLane, David Hathaway (leader). Photos: Kristin, Robynn, & David. 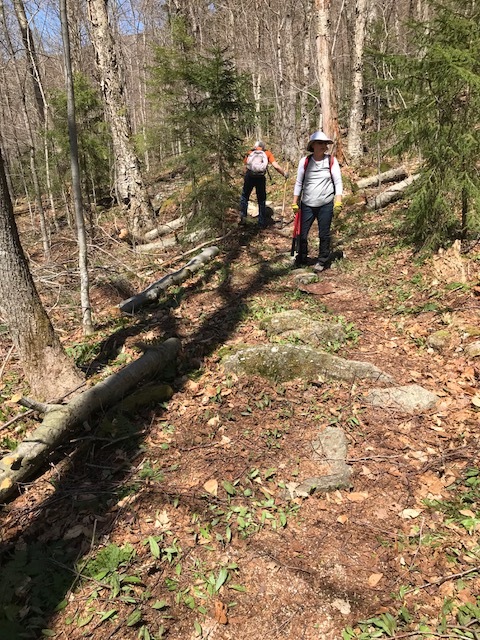 We had a great turnout of 14 for working on the Long Trail between Taylor and Butler and Nebraska Notch Trail, Clara Bow Trail and Butler Lodge Trail and the day turned out to be beautiful weather. We split up, with one crew going to Butler. They had a lot of cutting to do. 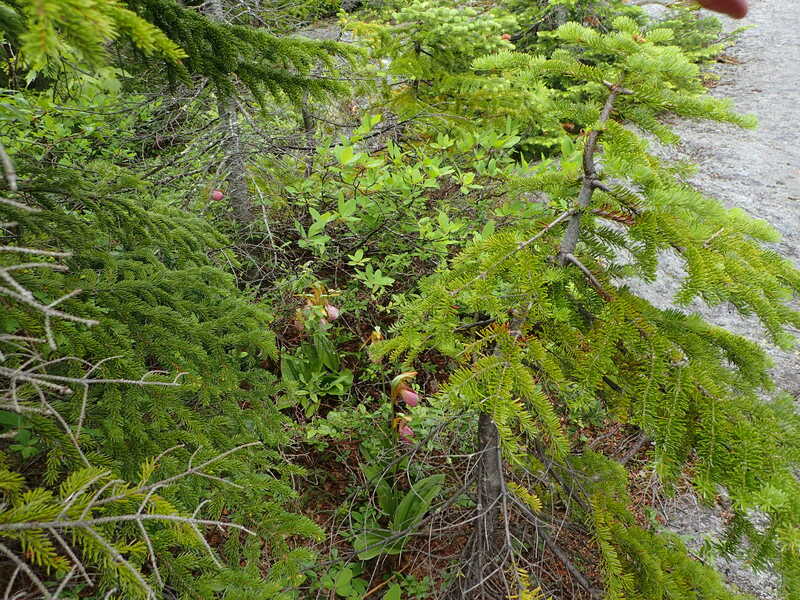 They also got some trees that were on the Wampahoofus Trail. The others worked on Nebraska Notch (lots of drainage clearing), with a sub-group going on to Taylor and returning via Clara Bow Trail. 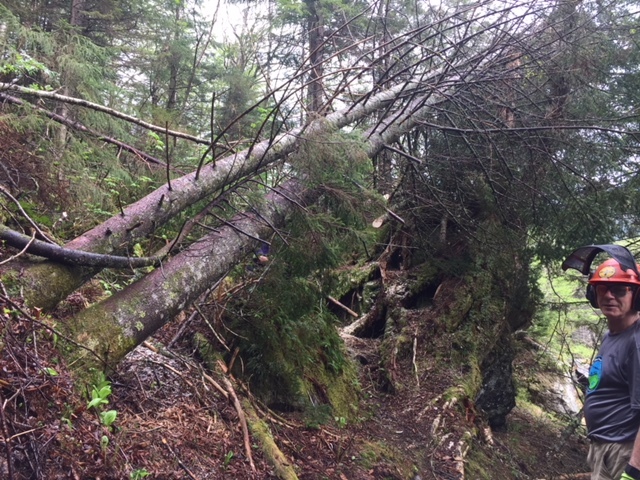 the biggest blow down was just before Twin Brooks tenting area. All the groups gatherd at Twin Brooks and headed straight down. 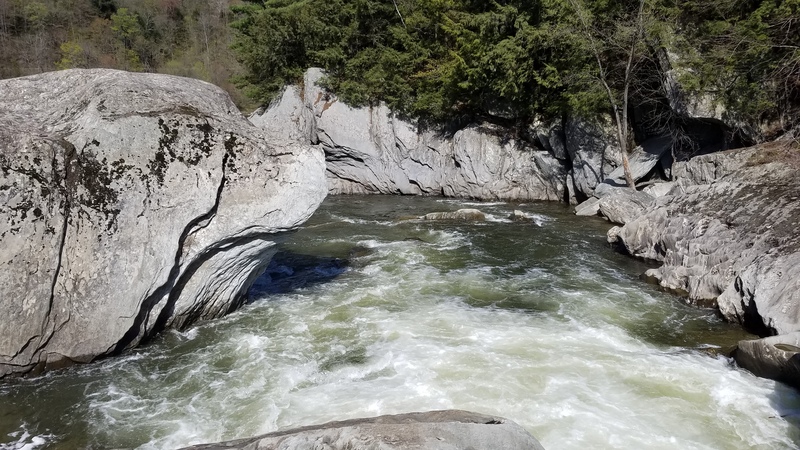 The workers were Jonathan Sands, Heather Hinman, Sun Kim, Bill Moore, Phil Hazen, Peter Kassel, Carol Irish, Scott Alberson, Tom Hall, Leanne Shulman, Ben Feldman, Dave Hathaway, Larry Gagne and leader Pam Gillis. Many thanks to everyone for a great work day! 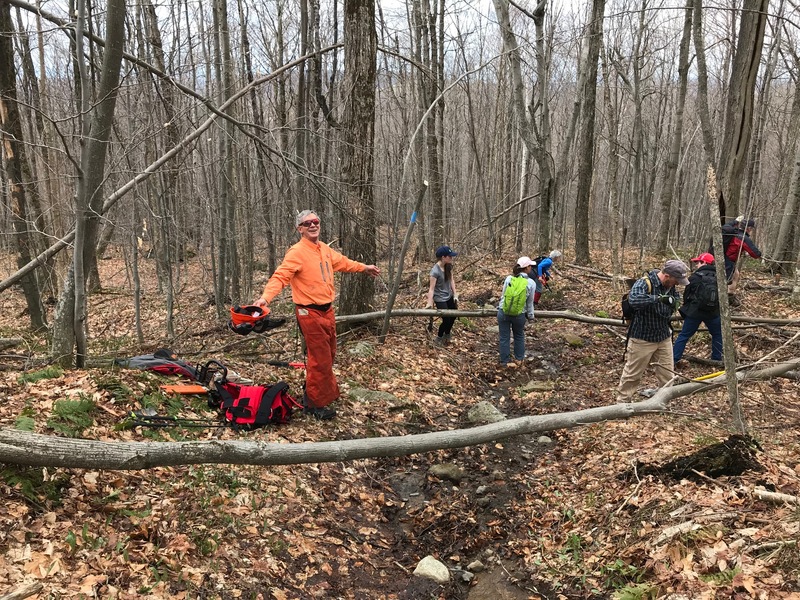 Great weather and great turnout for our first spring trail work. 15 people so we divided into 3 groups of 5. 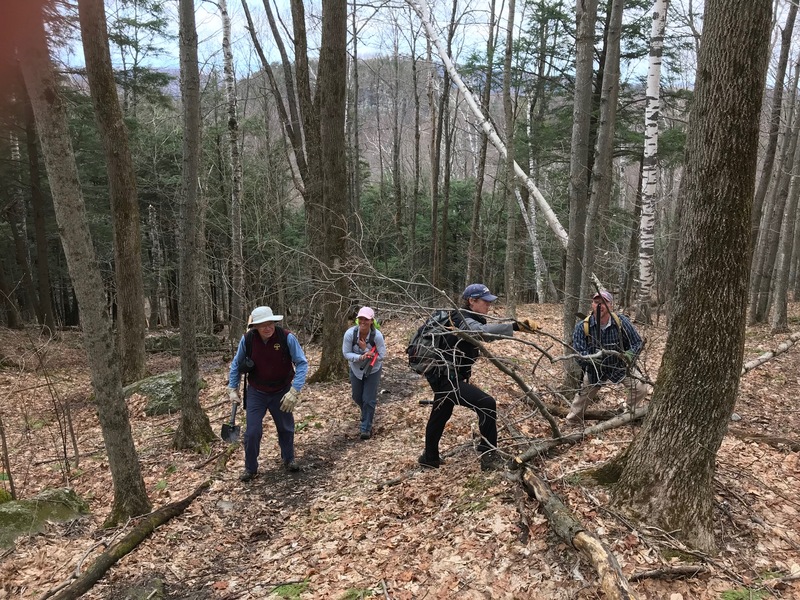 One group went from Bolton Notch Rd to Buchanan Shelter, one group went from Bolton Notch Road and then the LT south, and the last group went from the new parking lot on Rt. 2 on the LT north until they met the second group. 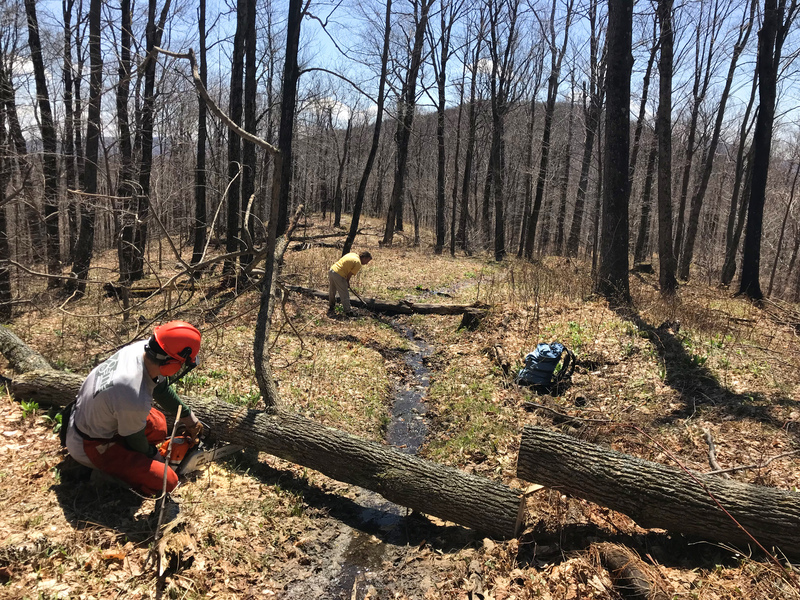 the first group had the most trees to cut, but all groups did some sawing. 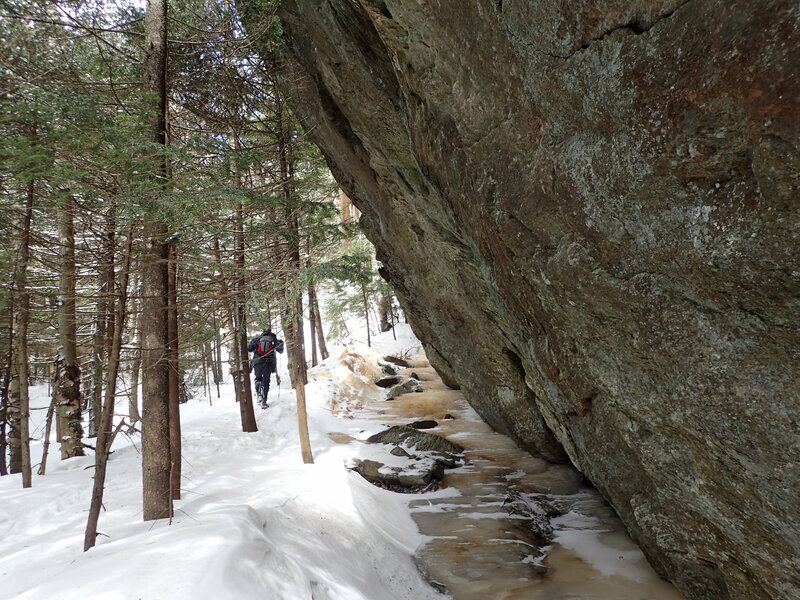 The trail was in pretty good shape. We also clipped and dug out places for drainage. 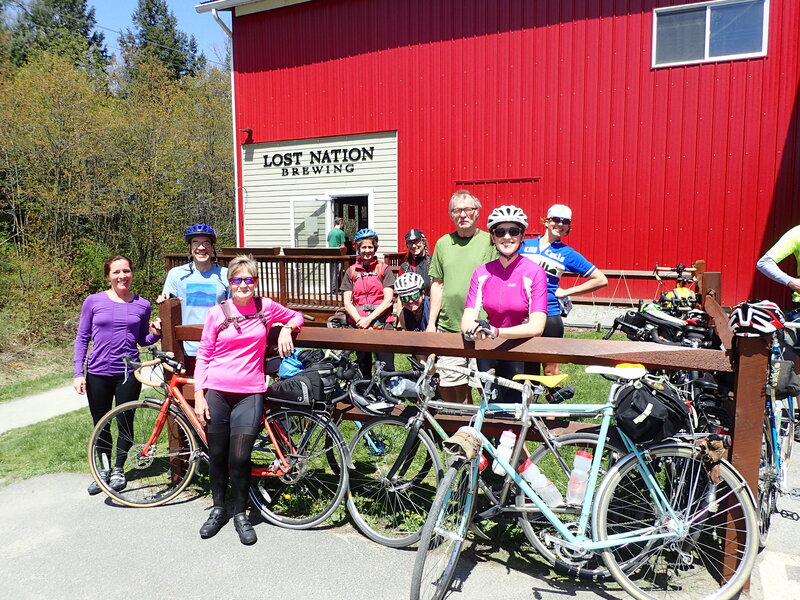 Attending were Pam Gillis (leader), Ted Albers (group leader), Phil Hazen (group leader), Mike Arthur, Ann O”Day, Reid Willis, Kimberly Farone, Thomas, Mary Keenan, Peter evan Smigh, Paul Believeau, Arthur Beliveau, Jessica Beliveau, and Dasha Zentrichova. Thanks so much to everyone! Many of us enjoyed refreshments at the end in the Rt. parking lot. 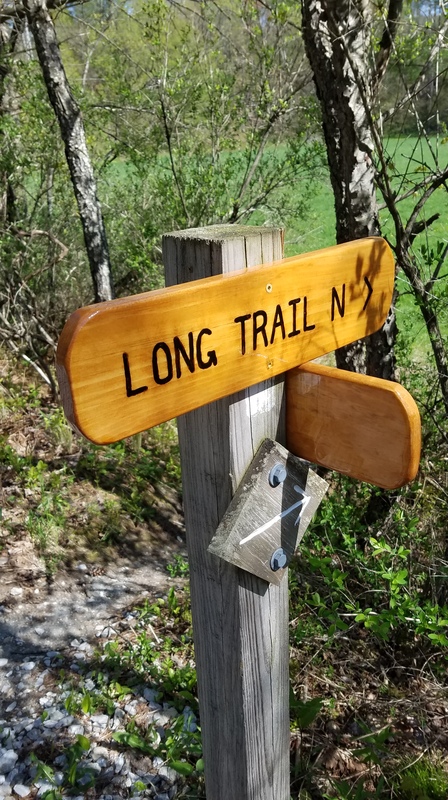 The hike is a loop 5 miles long that goes up the Honey Hollow Trail, climbing about 1000 feet of elevation, to the junction with the Honey Hollow Road, and then down the road and return to the cars. 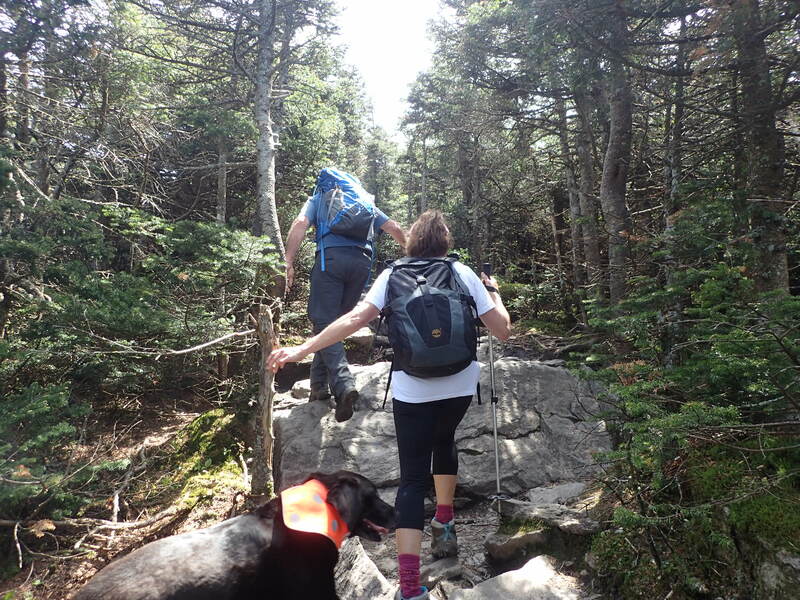 On the hike we always look for ferns, wildflowers, birds, and anything else the participants can identify. 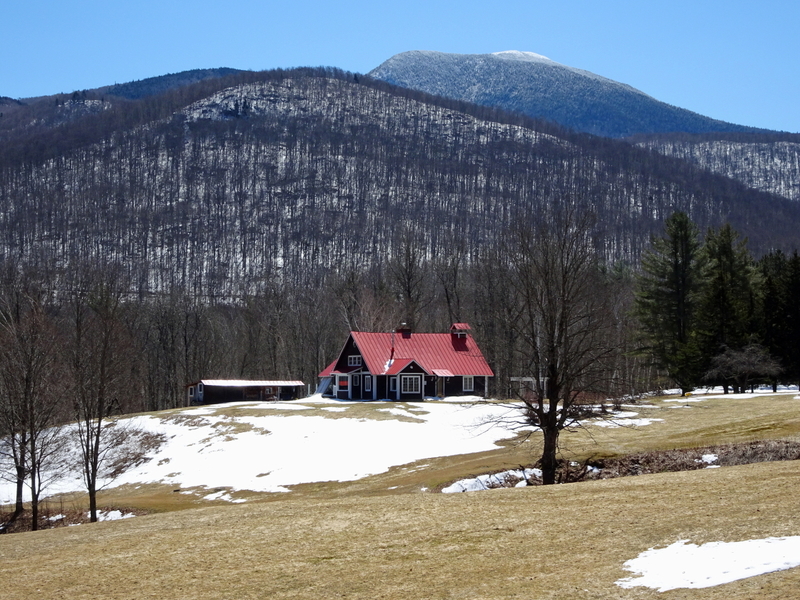 This year, we had a fine spring day, temperatures in the 50s, and 7 hikers. Scott Springer, Jack Lutz, Solveig Overby, Cathy Tilley, Cathy McIsaac, and Sheri Larsen joined trip organizer Rich Larsen for the walk. 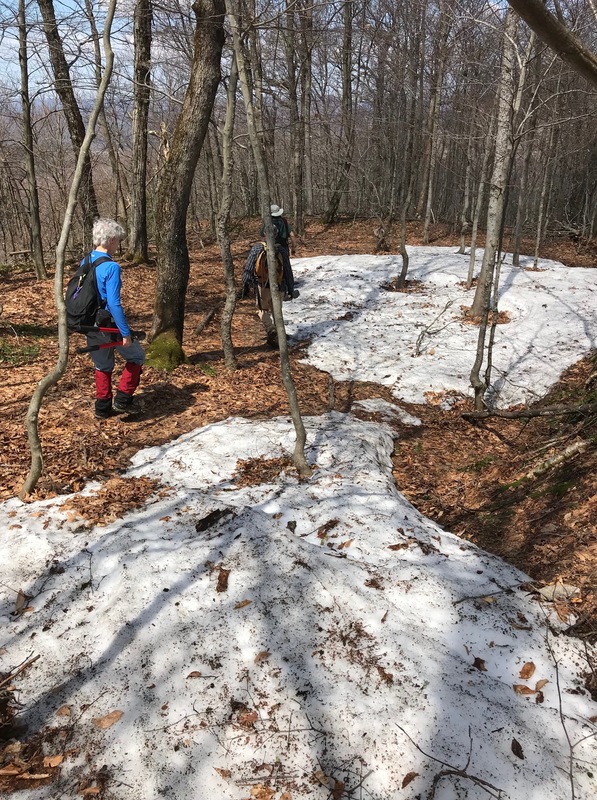 The only problem was that the weatherman had not heard about spring before this day – so the ground still had a lot of snow in spots, and on the trail up the only things we could observe were the places where various plants would be at some later date. 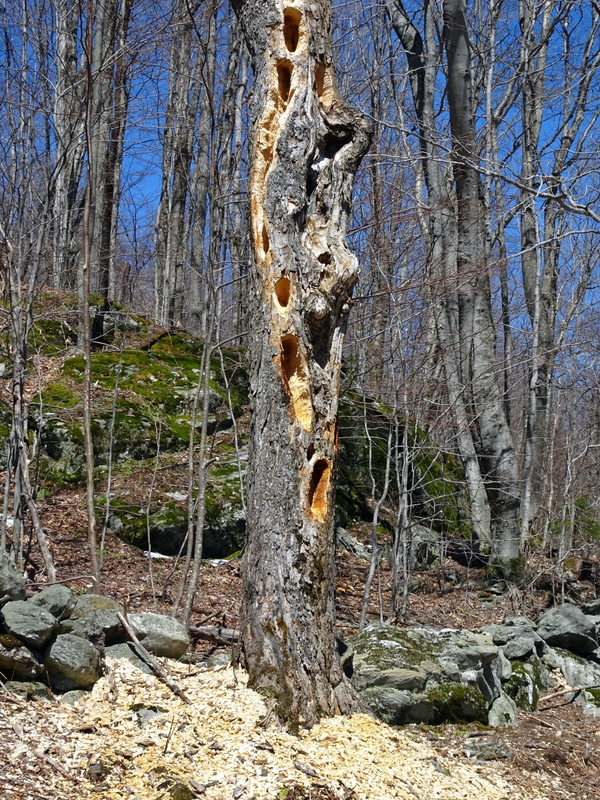 But, we had a good walk, with a few diversions around downed trees from the winter’s various windstorms. 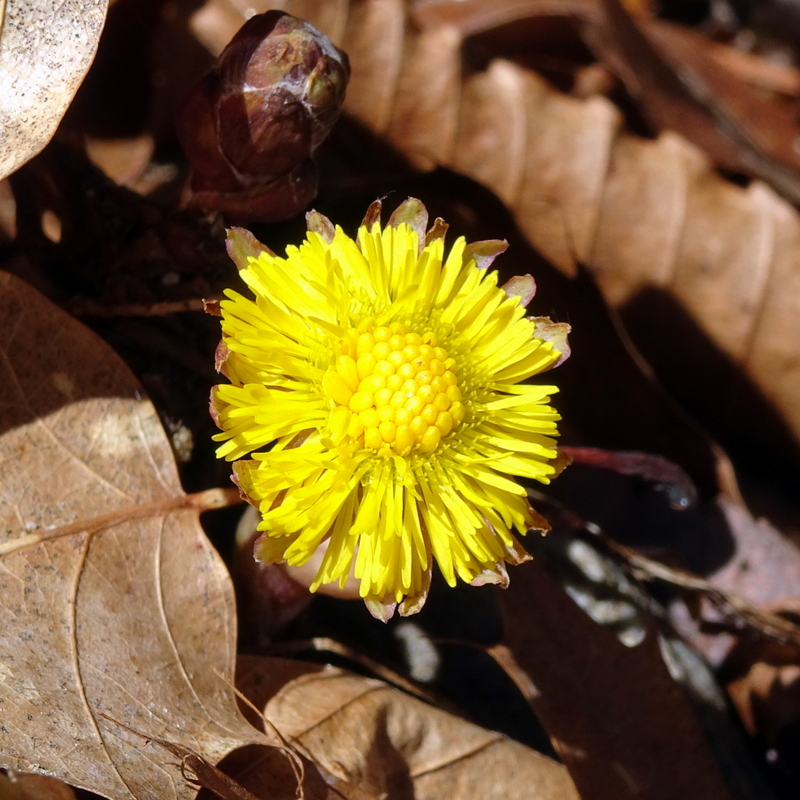 On the way down the road, we found the first flowers – Coltsfoot (is a group Coltsfeet?). Among ferns, we had Christmas Ferns and Scouring Rush – a fern-relative – but all the Royals, Ostriches, Cinnamons, etc were still waiting to make an appearance. Birds were limited to few sparrows, crows, robins and chickadees. Other than trees, nature was pretty sparse. We had a good walk, at a fairly leisurely pace, taking 3 hours for the loop. 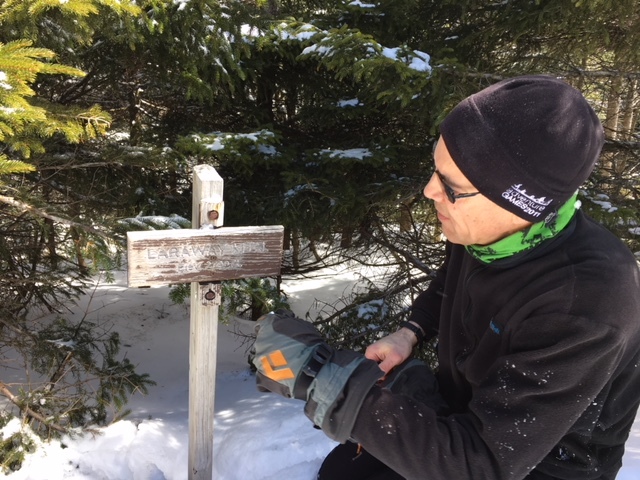 Howard VanBenthuysen, who makes the wonderful new trails signs for the GMC, saw this trip on the schedule and asked if we could bring up and install a replacement for the Laraway summit sign, which we did. 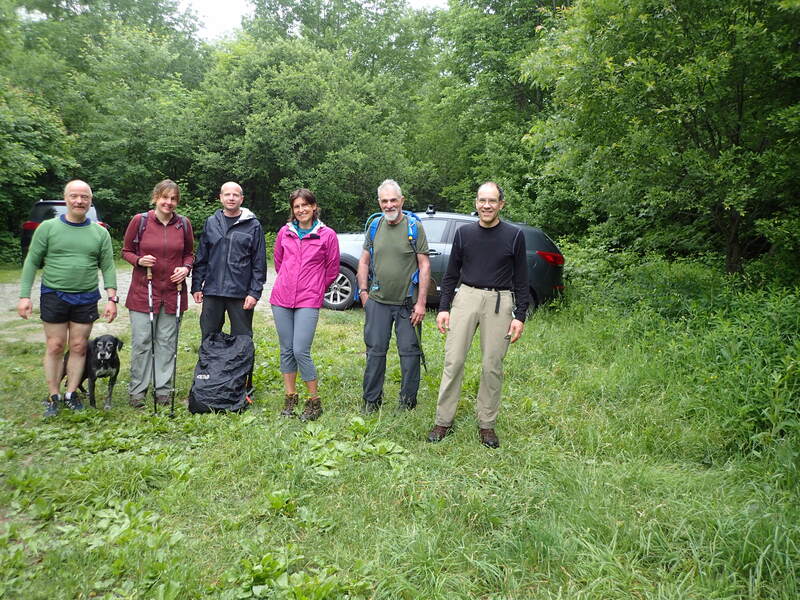 Seven of us met at the Cambridge park & ride and took three cars up to the Codding Hollow trailhead, where we met our eighth participant. 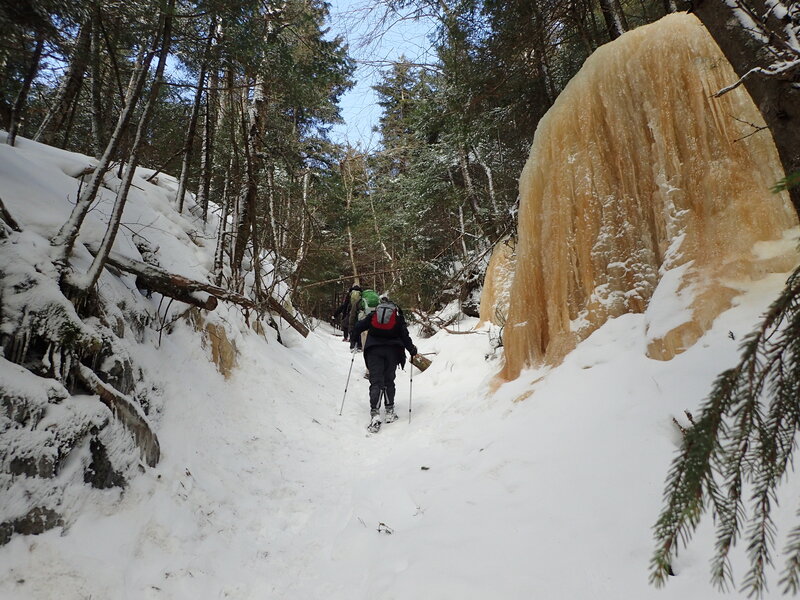 After recent thaws and rain and a subsequent hard freeze the snow surface was very hard, so we left snowshoes in the cars and started up in microspikes around 9:45. It was sunny and in the high 20s. 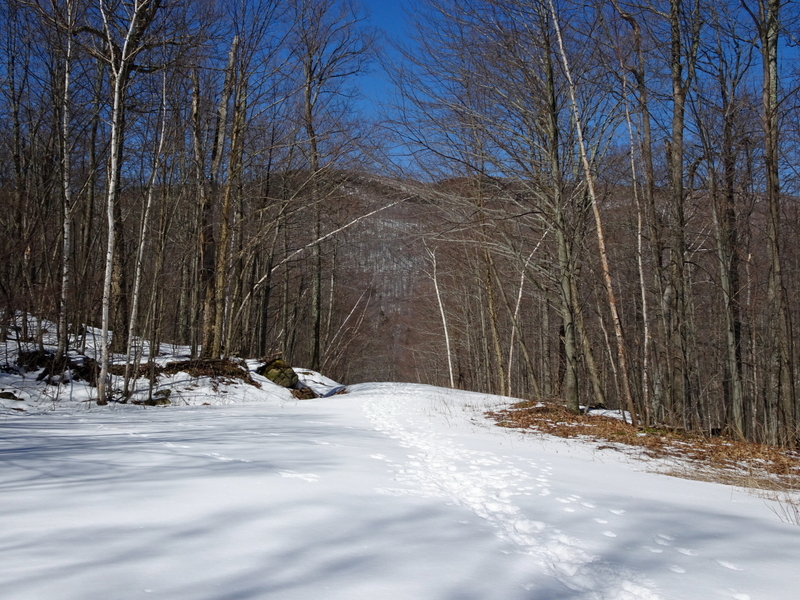 There was a faint track from previous hikers, but it was snow covered, so we managed to lose the trail once briefly on the way up. 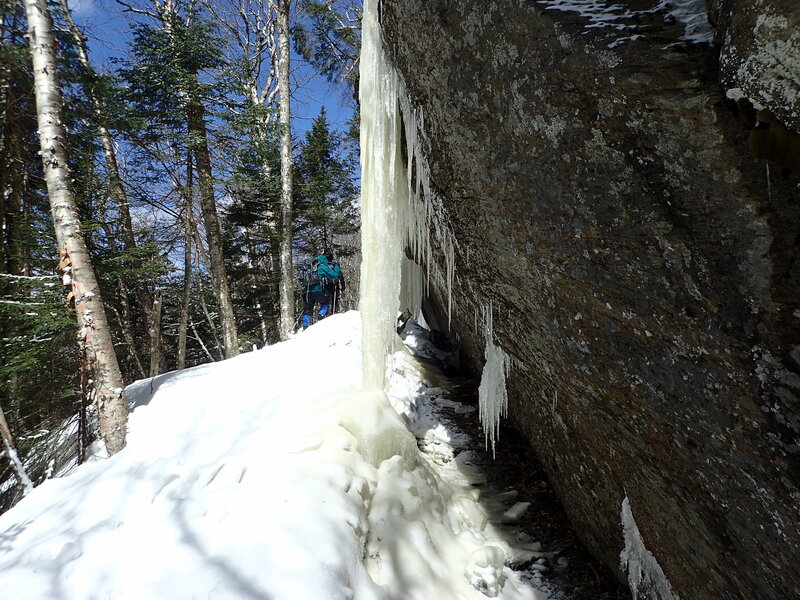 We reached the start of the cliffs around 11, and spent some time admiring the impressive ice columns coming off the cliffs. We got to Laraway Lookout around 11:30, but it was pretty windy so we didn’t stay long. 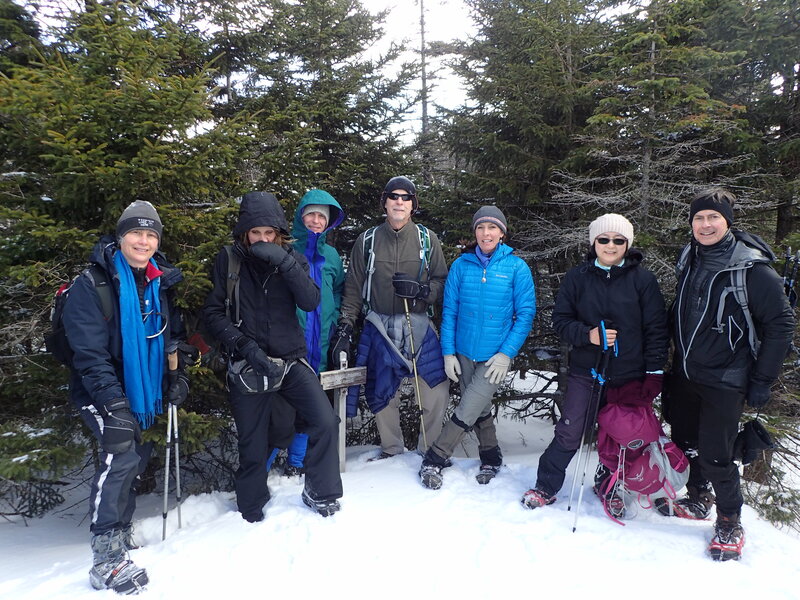 We then continued up to the summit, ducking under a lot of snowy branches, and reached the summit around noon. I hauled out all the tools I’d been carrying (drill, wrenches, etc.) and found I didn’t have the right socket for the bolts holding the old sign, but managed to get an adjustable crescent wrench on them (both sheered off at the post when turned). The new sign went up easily, and will be a great improvement on the old one, which was weathered into near illegibility. 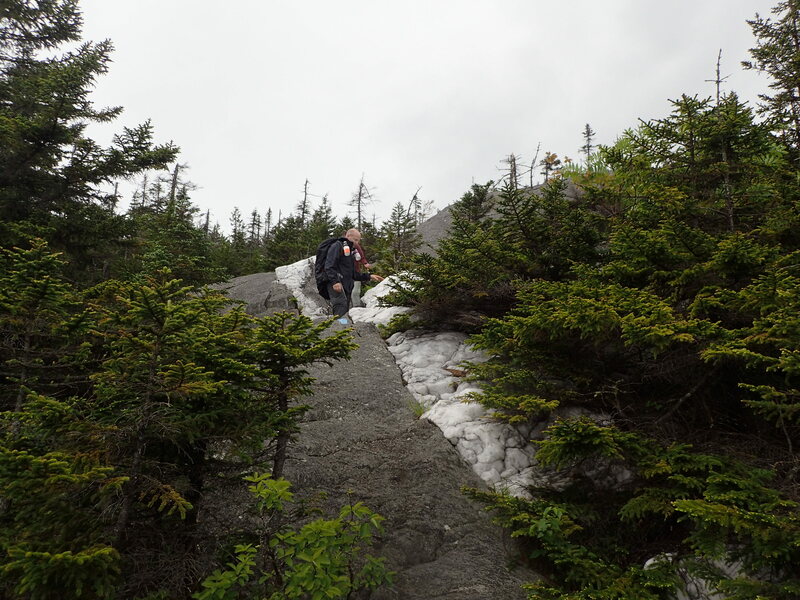 After a brief lunch we headed back down, meeting a few people and dogs headed up, and reached the cars around 2. Participants: Steve Titcomb, Ray Geddens, Lori Johnson, Sunny Kim, Deb Forcier, Robynn Albert, Tom Smith, David Hathaway (leader).